ETANYA, Israel, May 17, 2013 (AFP) -In openly displaying his homosexuality while serving as an Orthodox rabbi, Ron Yosef has broken a major taboo in the closed religious world that he inhabits. Although May 17 is to be marked International Day Against Homophobia, the biblical stance on homosexuality remains clearly laid out in Leviticus, one of the five books of the Torah, which says that the sexual act between two men is an "abomination." But 38-year-old Yosef, who holds an Orthodox rabbinical diploma, believes it is possible to be "both gay and observant." He first became aware of his sexual orientation in his early 20s, with the realisation forcing him away from the faith and into the welcoming arms of secular Tel Aviv, the gay capital of the Middle East. But it didn't last long. He soon realised his faith meant too much to him, and he returned to the fold, taking the road less travelled by many of his peers in the same situation. "By the age of 30, I was finally at peace with myself after deciding I could be both Orthodox and gay even though many observant people in the same situation had left the religious world," he told AFP. In 2008, he set up a website to help others in his situation which soon turned into an organisation known as HOD, the Hebrew acronym for "Orthodox Jewish homosexuals." "We wanted to educate the religious community about this phenomenon and offer a solution to people who are both gay and religious, by letting them reconcile their double identity," he explains. A year later, Yosef became the first -- and still is -- the only Orthodox rabbi to come out, in an interview with Uvda, one of Israel's leading investigative journalism programmes. Three years later, he could finally say he had "broken the wall of silence in the religious world." 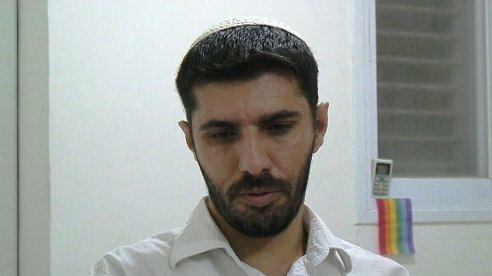 More than 6,000 people have turned to HOD since it was set up with the goal of initiating "a public dialogue in the religious community, among its leaders, its rabbis... that would lead to an improvement of the social situation of the religious homosexual man, within the religious society." "We are pioneers who are walking an unpaved path, who are part of the religious community, and who wish to remain part of it. We do not give up on our religious identity, nor do we wish to abandon our homosexual identity," the association's website says. Although his group has won the support of more than 150 Orthodox rabbis, Yosef is not always welcomed within religious circles. "Since I came out in 2009, I have been threatened but overall, I was surprised by the welcome I received in religious circles," he said. Today he lives in a religious neighbourhood in the northern coastal resort town of Netanya, where he gives courses in Judaism and looks after his flock of around 50 families that attend the synagogue where he serves. "I was ready to resign my post when I first came out about my homosexuality, but they decided to keep me on," he smiles. But rabbis who try to "cure" observant Jews of their homosexuality make him angry. One such group, Atzat Nefesh, was set up in 2001 by Rabbi Shlomo Aviner, a leading figure within the religious Zionist movement. The group bills itself as a hotline for people looking to change their sexual behaviour or orientation and offers help to those struggling with "contradictory homosexual tendencies in order to bring them back to the right path," its website says. "I'm not asking the rabbis to authorise what is forbidden but to find answers for those who want to stay religious," says Yosef, who believes Atzat Nefesh is a "dangerous" organisation. Unlike other religious gay groups, members of HOD don't participate in pride parades. "We want to integrate ourselves into (religious) society without pushing our sexual differences in people's faces, but while being accepted by all," Yosef explains. Although he lives with his partner, who is also Orthodox, they do not go out in public together as a couple, and Yosef says the life of some homosexuals who live in communities ironically "resembles the ultra-Orthodox Jews who live in ghettos" because of the resultant reclusiveness. "I'm not ashamed of my sexual identity, but there's a difference between that and systematically bringing it up," he says.